Each year, the Rotman Institute of Philosophy and the Department of Philosophy at Western University organize a public lecture series, co-sponsored with the London Public Library. 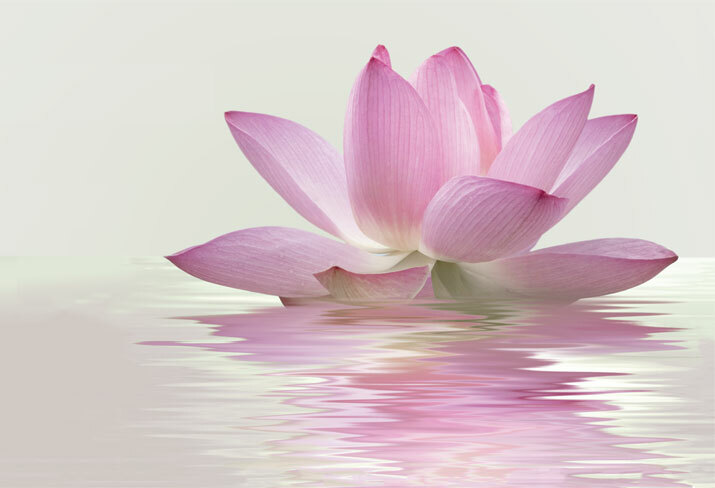 The theme for this year’s lecture series is happiness and well-being. The four speakers taking part in this year’s series have expertise in a range of fields–ethics, feminist philosophy, philosophy of science, and sociology–and will address the theme from unique perspectives. All lectures will be held in the Stevenson & Hunt Room at Central Library, on Thursday evenings, from 7 – 8:30 pm, on the dates listed below. Attendance will be free and open to the general public. View a copy of the library event poster. This talk takes up five questions about women and well-being: Are women’s lives sufficiently different than men’s as to merit a separate account of well-being? What might a feminist theory of well-being look like? In general, do women lead better or worse lives than men? If women are happy with their lives, in unjust circumstances, does that count against subjective theories of well-being? How does equality relate to well-being in the context of the pay gap and the play gap? 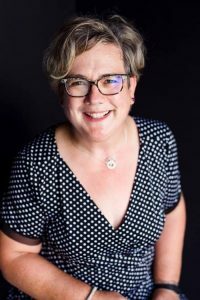 Samantha Brennan is Dean of the College of Arts at the University of Guelph, a member of the graduate faculty in Philosophy at Western University and at the University of Guelph. She is also a member of the Rotman Institute of Philosophy. Brennan’s main research interests lie in the area of contemporary normative ethics, applied ethics, and feminist philosophy. Read more about Samantha Brennan. Philosophers have been puzzling over the nature of happiness for thousands of year. Somewhat surprisingly few have deigned to reflect on the nature of children’s happiness. In this presentation, I will seek to remedy this oversight by offering some philosophical thoughts on the nature of children’s well-being. Anthony Skelton is currently associate professor in the Department of Philosophy at Western University. His research focuses on issues in moral philosophy and practical ethics. He received his PhD in philosophy from the University of Toronto in 2005, where he wrote a dissertation under the direction of Wayne Sumner. In 2004-2005 he was Social Sciences and Humanities Research Council of Canada Post-doctoral Fellow in the Department of Philosophy at the University of Michigan. In 2012-13, he was Visiting Scholar at the Uehiro Centre for Practical Ethics and a Plumer Visiting Research Fellow at St. Anne’s College, Oxford University. In 2015, he was a visiting researcher at Fondation Broucher. He received the University Students’ Council Teaching Honour Roll Certificate in 2008, 2011, 2012, 2014, and 2016. 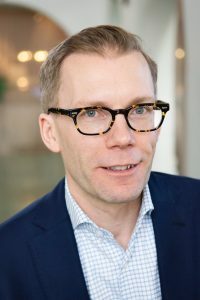 He is an Associate Editor of the Journal for the History of Analytical Philosophy. Family members provide many important functions such as childcare, financial support and caregiving. Because of demographic changes, older people today may have fewer kin to rely on than in the past. This lecture addresses changes in family networks among older adults and the implications for health, well-being and social integration. 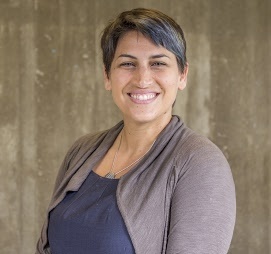 Rachel Margolis is an Associate Professor in the Department of Sociology at the University of Western Ontario. Her research addresses how family dynamics shape population change in developed countries. She works in the following areas: demography, fertility and family change, population aging, population health and well-being, and medical sociology. She did her PhD in Demography and Sociology at the University of Pennsylvania, MSc in Population and Development at LSE, and BA in Government at Cornell University. Read more about Rachel Margolis. The “science of happiness” explores who’s happy and why, and it’s never been hotter or more controversial. But what is happiness, and why does it matter? The answers turn out to be difficult and philosophically interesting, and serve to show the value of philosophical reflection to the practicing scientist. Erik Angner is Professor of Practical Philosophy at Stockholm University. As a result of serious mission creep, he holds two PhDs – one in Economics and one in History and Philosophy of Science – both from the University of Pittsburgh. He is the author of two books, Hayek and Natural Law (2007) and A Course in Behavioral Economics, 2nd Ed. (2016), as well as multiple journal articles and book chapters on behavioral and experimental economics, the economics of happiness, and the history, philosophy, and methodology of contemporary economics. Read more about Erik Angner. 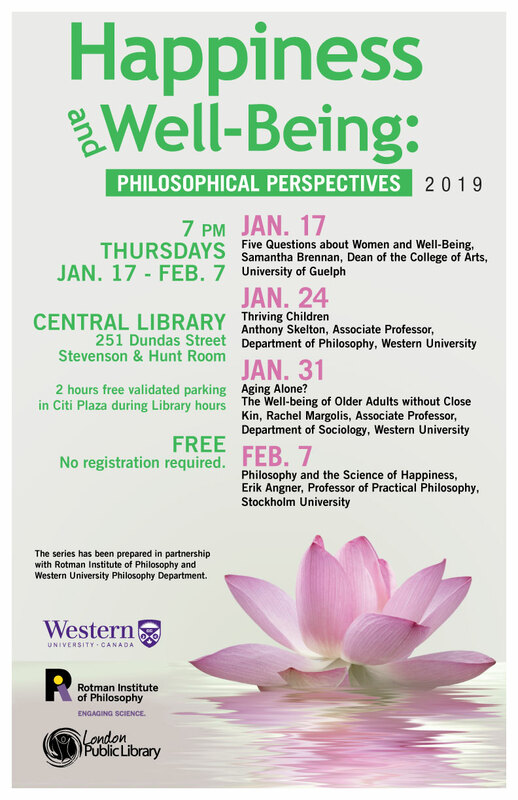 This event series is co-sponsored by the Department of Philosophy at Western University and the London Public Library. Janet Martin: Evidence Reversals: How Fragile is the Evidence Base? Join our mailing list to hear about Rotman news and upcoming events.